Grand Ayatollah Ali al-Sistani is the leading Shiite cleric in Iraq. Although he comes from what is known as the quietist school of thought that is supposed to mean staying out of politics he played an active role in shaping the post-Saddam government in the early years of the U.S. occupation. Since then he has not been so publicly involved in affairs, but he did try to quell the violence during the civil war, and today has become a critic of the poor governance in the country. To help explain the Ayatollah’s role in Iraqi society since 2003 is Fadel Reda al-Kifaee a senior adviser at Management Systems International who has extensively studied the Hawza, the Shiite religious establishment. 1. Ayatollah Sistani was a vocal critic of the U.S. occupation under the Coalition Provisional Authority (CPA). Paul Bremer came into the country with his own vision of how he wanted the new Iraq to develop that included a two-year transition to put together a constitution, develop democratic principals amongst the society, and then eventually hold elections for a new government. What problems did Sistani have with Bremer’s plans, and who won this battle of wills? I think the main concern on the part of Ayatollah Sistani regarding the CPA’s approach was the Islamic identity of the Iraqi people. The Ayatollah feared Americans would engineer the constitution in such a way that fixed the western style of liberal freedoms. I think he also feared that the CPA would ignore, or marginalize, the role of Islam in the judiciary and legislation. Ayatollah Sistani was sure that the Shi’a would revive even with the CPA’s original plans realized. Sistani also seemed to worry about the American presence in Iraq. He may have feared that having a political process based on the American roadmap would produce governments that legitimized a long military presence, which in turn was likely to compromise the social identity of Iraq. It seemed that both sides, the CPA and the supreme Marji’, ended up with a deal that secured, or so they thought, their respective minimum level of demands. The result constitution’s Article 2 states that, “Islam is the official religion of the state and is a foundation source of legislation,” and it prohibits enacting laws that violate one of Islam’s pillars. At the same time, it mentions that no law is passed if it violates democratic principles or the rights and freedoms mentioned in the constitution. In the same article, it comes back to emphasize that “the constitution guarantees the Islamic identity of the majority of the Iraqi people…”. No doubt that Sistani won the battle over having a direct-elected constitutional assembly, but it turned out that it was a battle within a war of wills. 2. After the CPA seemed to give in to Sistani’s demands it went ahead and drafted the Transitional Administrative Law (TAL) that acted as the constitution until a new one was drafted by the Iraqis. Why do you think the Americans went ahead with this move, and what was the Ayatollah’s reaction? The TAL represented the CPA’s counter attack to Sistani’s moves, if we continued calling it a war. Bremer made use of his relations with Iraqi politicians, including the Shi’a, in his Iraqi Governing Council in passing this dangerous legal document. The Americans were trying to make sure that they would end up with a constitution that led to a ‘liberal state’ that didn’t threaten its neighbors even if that came at the expense of its internal cohesion. The Americans also feared that Sistani would urge his followers to ask for a sort of religious constitution, one that didn’t embrace the Iranian style of vilayat al-faqih but granted the religious establishment a considerable role over state institutions. Sistani immediately realized that the TAL was formulated to be a blueprint for the permanent constitution. His stance over this move was one of his most powerful positions. In addition to issuing many communiqués condemning the TAL, the Ayatollah warned the Security Council not to mention the TAL in its then prospective resolution on Iraq and the council respected Sistani’s will. Sistani’s main objection was that the TAL would threaten Iraq’s unity by promoting sectarian politics and racist divisions. 3. Iraq held two elections in 2005. The first was to put together a temporary parliament that would draft a new constitution, and the second was to create a permanent government. 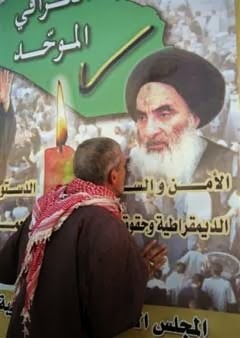 Sistani was largely responsible for putting together the United Iraqi Alliance (UIA), which was made up of the largest Shiite Islamist parties such as the Islamic Supreme Council of Iraq, the Dawa Party, the Fadhila Party, some Sadrists, and others. In turn, the UIA used Sistani’s image in its campaigning. What was the Ayatollah’s thinking behind putting together this list? Formulating the UIA seemed controversial considering the Ayatollah’s anti-sectarian methodology. 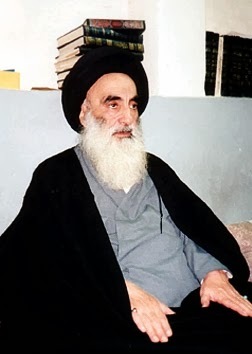 I think Ayatollah Sistani was mainly trying to have a major block in the constitutional assembly that would be able to embed the principles Sistani had long advocated, some of which were mentioned above, in the permanent constitution as well as preventing the attempts of transferring some of the TAL’s articles into the constitution. What happened after winning the election was that Sistani seemed to lose control over the leadership of the UIA. Although the UIA’s leaders pressed and managed to include some of Sistani’s major demands in the constitution, they began acting independently in many political fronts. Their control over the state’s resources after forming the government led by Ibrahim al-Ja’afari made them feel confident to the extent that they built the second UIA, formed prior to the December 2005 elections, basically without consulting the supreme Marji’ ! Eventually, some controversial articles of the TAL were copied to the constitution; for instance, the condition that the constitution could be vetoed once three provinces voted against it, a matter, which Sistani openly opposed. The apparent outcome of formulating the UIA was avoiding the dispersal of Iraqi Shi’as’ votes by the one list-one constituency electoral system that helped the Shi’i political parties consolidating power inside the first elected parliament. If this was what Ayatollah Sistani envisaged, then this would be a contradiction to his many fatwas that called for a government based on a political majority rather than a sectarian one. I think the main goal on the part of Sistani on the UIA matter was to draft a constitution away from the TAL and the American influence. Another factor may have been trying to help these Shi’i parties to sit together and practice dialogue because Sistani sensed the high level of hostility among some of them, one that might have risked the security of holy Shi’a cities and that was what happened latter on in some occasions. By formulating the UIA, I don’t think Ayatollah Sistani was planning to have those Shi’ite Islamist parties permanently ruling the country for a simple reason; those parties believed in versions of vilayat al-faqih, and that methodologically contradicted the school of thought of Sistani. 4. Sistani’s role in putting together the constitution and Iraqi government brought up questions about what his position was towards democracy. Did he just want elections so that Shiite Islamists could come to power, did he believe in some kind of compromise between Islam and constitutional rule, etc. What are your thoughts on Sistani’s views? Although the Grand Ayatolah avoids directly announcing his stance towards democracy, I can say that he at least believes that the people should be a source of political legitimacy. The tone of his fatwas and statements dealing with elections and related issues uncovers a methodological tendency rather than mere pragmatic tactics to help Shi’ite Islamists winning. Ayatollah Sistani went further than many other Shiite Ulama in this regard as he frequently emphasized that parliament whether being a constitutional assembly or not must be directly elected by the people underscoring the issue of representativeness. In short, he not only accepts but also adopts democracy. At the same time, he makes sure that the religious authority has the right to dictate a democracy’s outcomes should this process produce something the marji’ believes threatens the Islamic social identity or the well being of society. The subject marji’ should use his social powers to practice this dictation. 5. In 2006 the Shiite shrine in Samarra was bombed and Iraq moved towards full-scale civil war. What was Sistani’s response, and was he able to stem the violence at all? The Ayatollah’s response was issuing a statement asking believers to peacefully protest the action asking not to involve in any retaliatory reactions. This fatwa and all the meetings the Supreme Marji’ had with various political and social players was not enough to prevent the violence. It seems that all Sistani’s efforts to stem the anger of Shi’a during the 2004-2005 escalating violence were gone with the wind. One important factor was the role of the Sadrist militia. Without this role, I think the country wouldn’t have gone to full-scale civil war. The issue was that Moqtada al-Sadr’s followers didn’t emulate Sistani and so were not religiously bound by his fatwas. 6. You mentioned how Sistani has had a mixed relationship with the Shiite religious parties that took power after 2005. Moqtada al-Sadr for example has fluctuated between trying to usurp Sistani’s position, sometimes through violence, while relying upon the Ayatollah to save him from crises like the August 2004 uprising and Premier Maliki’s 2008 Charge of the Knights offensive against the Mahdi Army. The Islamic Supreme Council of Iraq claimed Ayatollahs Khomeini and Khamenei as their spiritual leaders, but then claimed they switched to Sistani. The Dawa Party on the other hand, has consulted with Sistani, but do not claim to emulate him. In recent years, Sistani’s representatives have issued a steady stream of criticisms of the ruling parties in Baghdad about the lack of services, the deadlock in parliament, etc., and he has refused to meet with politicians. Why hasn’t he been more influential over these parties that he helped put into office? The relationship with the Da’wa Party has been relatively impacted by historic complications. The traditional current in Hawza has been basically against having clerics involved in politics. There is also the fact that the Hawza’s clerics have felt uncomfortable towards persons with western style outfits let alone having those same gentlemen specialize in Shari’a. The early leadership of the Da’wa was composed of both kinds of men; clerics involved in politics and suited men educated in Islamic jurisprudence. However, Ayatollah Sistani positively interacted with Da’wa leaders after they came back from exile as part of his openness to the exile opposition. Sistani has been known to have a warm relationship with the Al-Hakim family, which introduced prestigious religious figures to the community of Hawza. The late Ayatollah Mohamed-Baqir al-Hakim, who led the ISCI since 1982 until his death in a bombing in Najaf in 2004, made use of this relationship and so did his brother Sayed Abdul-Aziz who succeeded him at the top of the ISCI. Regarding the Sadrist Current, there has been clear alienation between them and the Grand Ayatollah. This current represents a Shiite social class of mostly poor and uneducated persons who feel they are discriminated against by other Shi’a especially the traditional Hawza. Away from the Sadrists, the relationship between Sistani and both ISCI and Da’wa has gone through many phases. The constitutional phase that lasted from 2003 to late 2005 witnessed relatively positive interactions. As shown above, Sistani helped those parties rise to power aiming at influencing the process of drafting the constitution. Since 2010 this relationship has been damaged with the Grand Ayatollah refusing to host leaders of those parties at his office. Sistani sounds fed up with the leadership of these parties, which has begun to openly disobey his guidance. The Ayatollah also may feel that they let him down for what the country ended up with in terms of corruption, public services, and security. 7. In 2012 there was a tidal wave of articles about Iran trying to find a successor to Sistani, specifically with Ayatollah Mahmoud Shahroudi. Was there any basis for these reports, and overall what role will Tehran play in determining who becomes the head cleric after Sistani passes? I acknowledge that promoting Shahroudi to Marji’iya (the Hawza’s supreme leadership) is implausible, in the foreseen future at least, considering the well-established doctrine of quietism in Najaf. The move of opening an office for Shahroudi in Najaf came as a part of integrated, well-organized efforts to influence the Hawza. The Iranians seemed to have long-term plans in Najaf. They are building socio-religious networks in mid and southern Iraq in general and in Najaf in particular, a matter that they envisage using at a later stage to influence the process of having a new supreme marji’ in Najaf. Such a process is too unofficial in Shi’ism and so the post-Sistani era will witness a transition in which no clear candidate will rise to the supremacy. Tehran will use its networks of institutions, students, teachers and scholars at the Hawza to promote publicity their desired candidate. The effectiveness of such efforts will partly depend on whether the camp of the traditional Hawza of Najaf has formed a consensus over whom to succeed Sistani. 8. The conventional wisdom about Ayatollah Sistani is that he comes from the quietest school of Shiite clerics as opposed to the activists such as Ayatollah Ruhollah Khomeini, Ayatollah Mohammed Baqir al-Sadr, and Ayatollah Mohammed Sadiq al-Sadr who believed in some form of direct clerical rule over society. There are all kinds of interpretations of Sistani’s stance towards politics ranging from the quietist school doesn’t mean complete absence from social affairs, to the Ayatollah having his own form of activism or that he has developed a middle road between the two. What’s your theory on Sistani’s stance towards involvement in politics? In a previous publication I called Ayatollah Sistani a ‘neo-quietist’ marji”. I know these classifications may be confusing, but they are generally valid. Sistani still adheres to the mainstream of quietism; having clerics abstaining from directly involving in politics unless a sociopolitical threat emerges. Meantime, the development Ayatollah has brought in to quietism has been in two integrated aspects; one is political and the other is social. 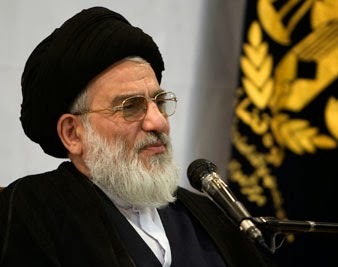 Political wise, the Ayatollah advocates a principle according to which the religious establishment must act as the guardian of the society’s Islamic identity. What he differs in from those Shiite constitutional clerics (Na’ini and clerics of Iran’s 1906 constitutional revolution) and others is that he believes that the marji’ must practice this guardianship using his social powers within the community of believers and must practice that from outside the government’s apparatus. The ulama that supported the 1906 revolt in Iran demanded having a quota for clerics in parliament mandated to observe the accordance of laws with Shari’a. In short, Sistani accepts democracy but with having an uncodified veto over its outcomes in exceptional occasions. In the social dimension of Sistani’s neo-quietism, I think the Grand Ayatollah is in favor of a principle in which the Islamic authority, the supreme marji’ in Shi’ism, must have the society’s ‘authorization’ to intervene to impose a social, or political, measure. By authorization I mean the readiness of the subject society to socially and politically accept this measure. I think that this approach on the part of Sistani is in accordance with his approach that a reform must be a bottom-up process that starts from society. The Ayatollah is a strong opponent of the Khomainian style of imposing Islamic virtues by state forces because according to the quietist doctrine the government has no legitimacy to impose Islamic measures in the age of occultation (Shi’as call the current age as the time of the hidden Imam). These two political and social aspects are integrated. Sistani encourages civil society to facilitate government reforms. The Ayatollah supports competent civil society organizations that try to be a partner in the public policy making process through communicating with policy makers and encouraging them to meet the real needs of citizens as the Grand Ayatollah sees them. These organizations are well-funded and employ prominent figures. In the long run, Grand Ayatollah Sistani seems to be preparing society in a way that would make the outputs of democracy in accordance with Islam’s core values and so the incidents of religious intervention in politics would be considerably minimized. This future condition would eliminate, if realized, the pretexts that a society needs the vilayat al-faqih system to preserve its Islamic identity.